Let’s hear it for the family of flower power greens! 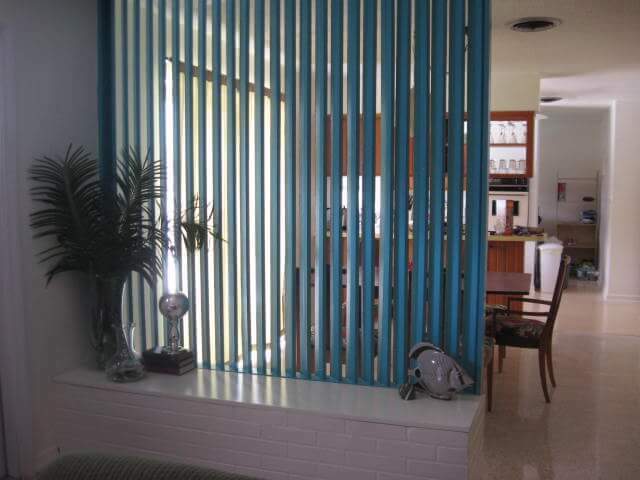 For the past several years, just for fun, I’ve named a Retro Renovation Color of the Year. In 2011, my first year, it was simply “Orange“. In 2012, I fancied things up and chose a color with reference to something classic vintage: Bitossi Rimini Blu aka Cobalt blue. This year, I’m continuing the vintage honor roll tradition, declaring the photo Retro Renovation 2013 Color of the Year: “Broyhill Premier Chapter One Lime Green“, after the color of the plastic doors on the bright white Broyhill furniture line, shown above. The color I’m talking about also could, I guess, be called just key lime green, maybe even grass green, or acid green. More or less. 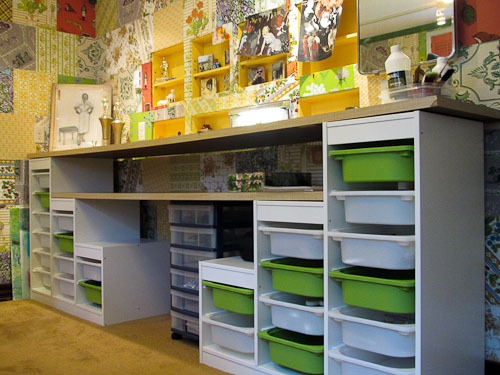 Unlike the folks at Pantone, who will make their big 2013 color of the year announcement within the few weeks, my color pick is more of an “idea” of a color — the flower power family of greens — rather than one exact, single color chip. So why did I choose this color? Because I like it! 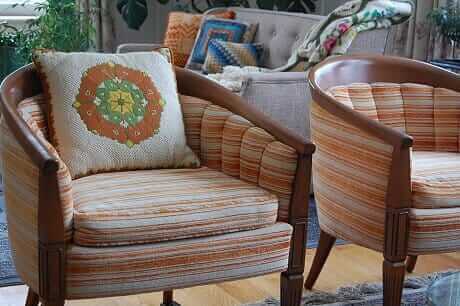 The photo directly above is from Furnish Me Vintage — Thanks, Jackie! The first photo at the top is my own, taken of the same piece at Furnish Me Vintage this summer. How dark is the green? Depends on the light. 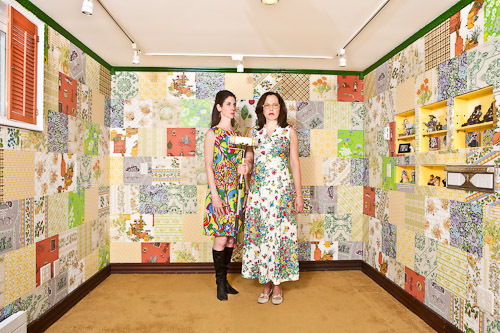 My big fat crazy retro office remodel included vintage wallpaper squares with shades of this color.This is when the 60s and 70s lime green really started to seep into my brain. Note: The richer green used for the ceiling trim is “Houseplant” from Sherwin-Williams. It coordinates really well. The whole room (now furnished) absolutely positively hit the funkadelic vibe I was aiming for. 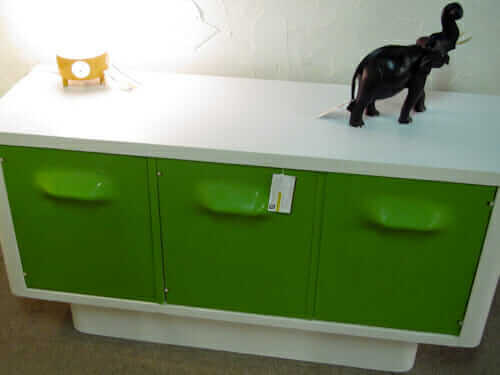 The lime-washing continued when I found these Ikea kids storage units and transformed them into legs for my crafting countertop. When I was renovating my office, I thought I might replace my gold carpet. My contacts at Shaw sent me a sample of the Citrus colored carpet from the HGTV line. I really like the color. But, I ended up just reinstalling my existing gold carpet, out of frugality and because the adjacent family room has the same carpet. 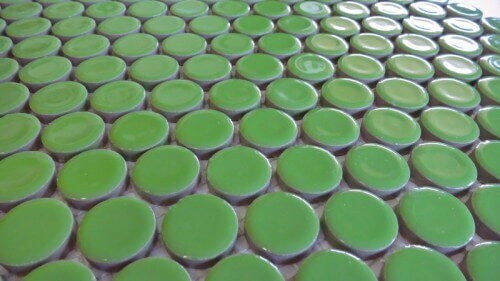 Modwalls makes a porcelain penny round tile called Key Lime. Yum. 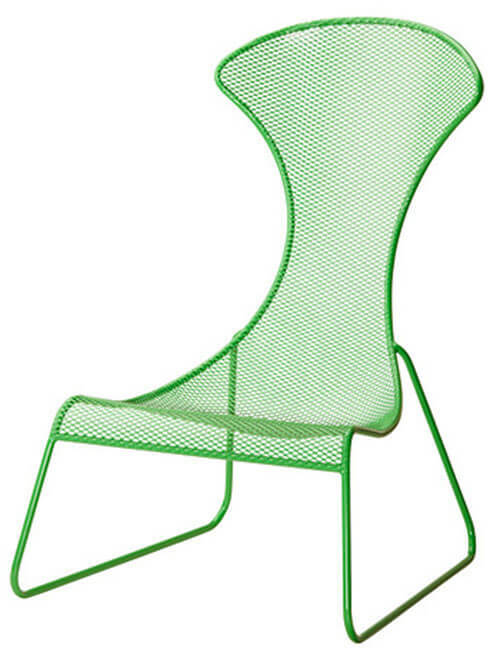 This Ikea steel chair is powder coated in a green that’s in the vein of what I’m talking about. Close enough. Yes, I was saving images from my recent travels to Ikea. 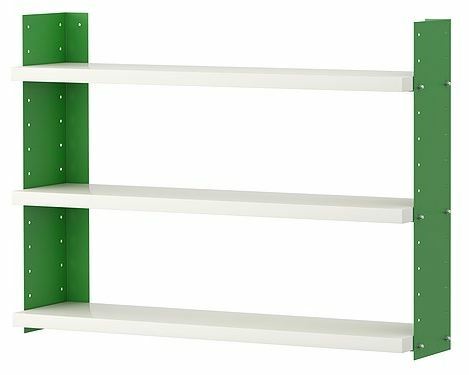 This shelving green also is close-ish. Green is such a friendly color. (<-affiliate link) is one nice looking hunka steel. 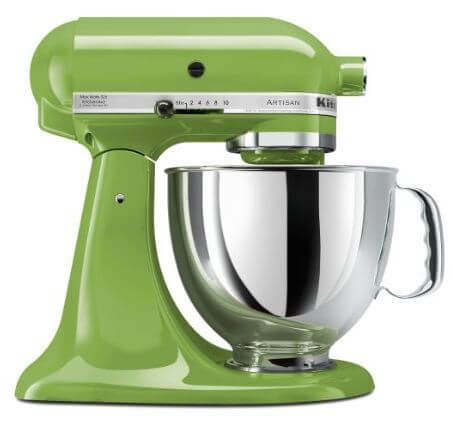 These mixers come in 24 retro colors — and golly, I could name any one of them a Color of the Year, they are so beautiful. 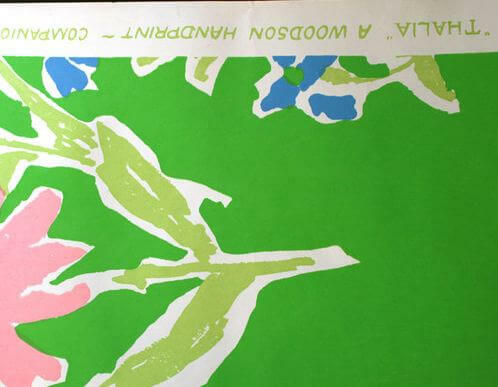 Above: Apple Green — not as acid as Lime Green, but all in the flower power family, as far as I’m concerned. 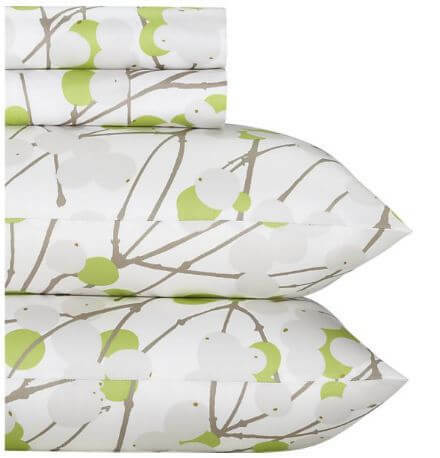 Marimekko Lumimarja Celery sheets, from Crate and Barrel. And you know I luv me some Loudmouth Golf — Magic Bus pants, all new. Have a Nice Day! So, what do you think my 2013 Color of the Year, readers? 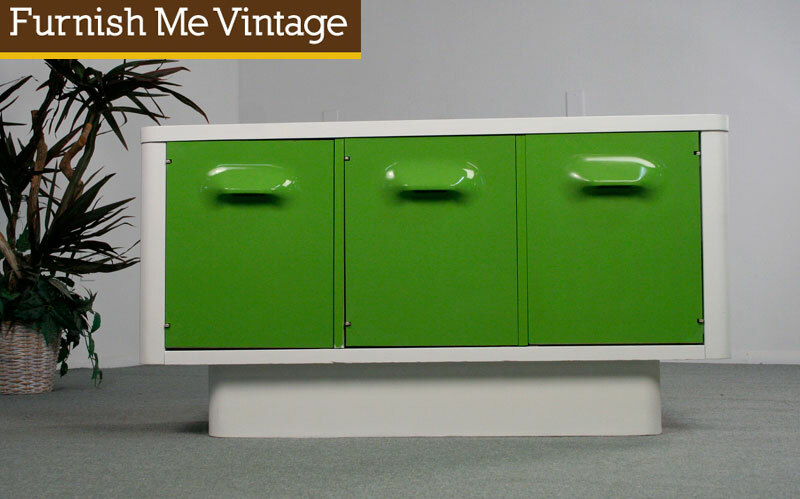 Do you have rich lime green anywhere in your house? While all the other girls wanted pink, I had groovy 70’s green SHAG carpet, buffalo checked groovy green curtains, linens & matching desk. 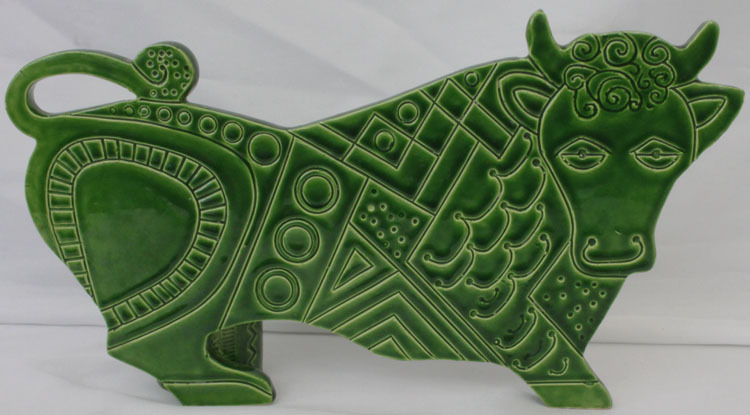 It was a limey 70’s green bonanza! We just finished the kitchen in our house a few weeks ago. 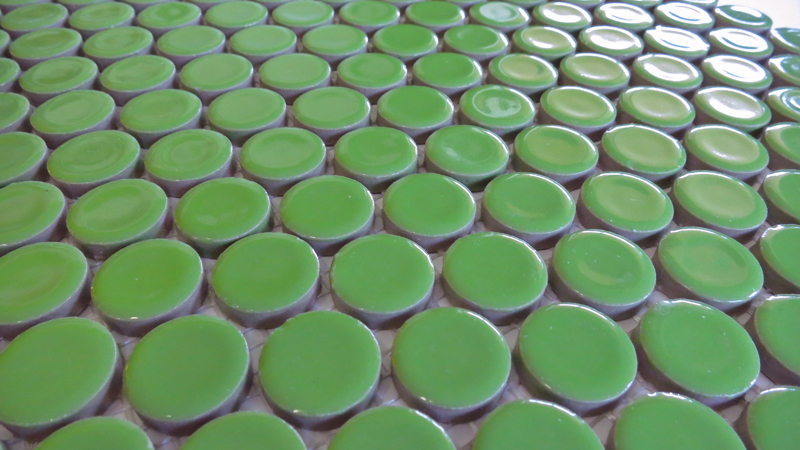 Our entire back splash is done in key lime subway tiles. We probably would have gone a little more kelly green if it wasn’t going to cost an arm and a leg. My husbands office is Retro Avocado (a darker lime color), and we have the most amazing couch in kelly green. We LOVE green! What color did you use on the walls of the bedroom with the green carpet?